Another incredible week has passed by and in case you haven’t had a chance to check in on our community, our Customer Transformation Coach Candida gives you a sneak peek into our Secret Slimmers & Momentum Maintainers groups, thanks to her New You Plan Community Highlights of the Week! What an utterly awesome week! We have had cocktails and dreams, non-scale victories, gorgeous goal outfits and once again the sun is blissfully shining! What could be better?! 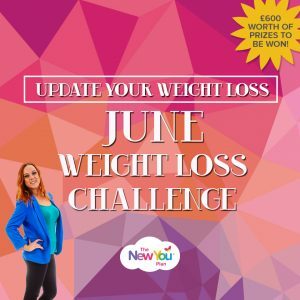 The June Weight Loss Challenge is moving along nicely with many of you updating your weekly losses. We had our first winner on Monday! The lovely Leanne Cromack chose a month’s supply of products as her prize – WOOHOO. Keep updating everyone. You must be in it to win it and there are stunning prizes to be won! I am loving how a lot of you are taking part in the daily tasks to win prizes. 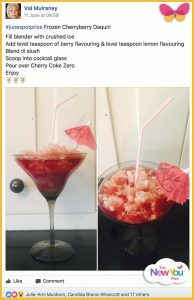 My most favourite task so far, this week has been Cocktails and Dreams. Val Mulraney’s winning concoctions were just to-die-for. I am definitely going to be making these! Jackie Murphy’s take on an Irish Coffee Mocktail was genius and looked so creamy and tasty! Do take part in the daily tasks, as not only can you win £10 of New You Plan points added to your account, these tasks are here to motivate you and to have a lot of fun in the process. The stunning Sharon Edwards posted up her goal outfits. She told us how her outfits made her feel and how determined she is to get into them. She is so close to goal but we still need to have that final aspiration to push us to success. I had two bridesmaids’ dresses to motivate me which I HAD to get in to. I hung them up where I could see them clearly. This really motivated me to keep pushing forward to lose those last few pounds. Try it! It really does work! 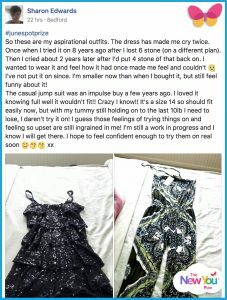 Maintaining can be a challenge for some, however, Diane Allen is successfully maintaining her ten stone loss, which is incredible!! This is fantastic! You work so hard to get the weight off but it’s even more difficult to keep it off. This is when the work really begins. It’s all down to mindset and re-educating yourself and squashing any bad habits. 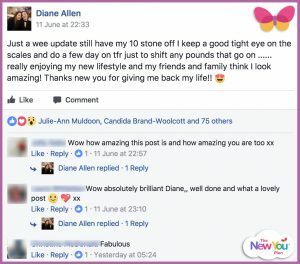 Diane has shown us that her new healthy lifestyle is achievable and incredibly satisfying. Her newfound empowerment is helping her keep that fabulous weight loss off. 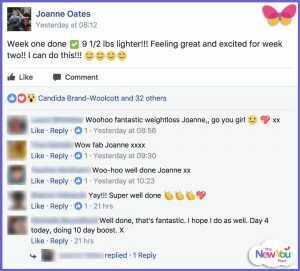 Joanne lost nine and a half pounds! WOW! Now that is motivation to carry on! Anna O Shea is rocking the plan to the max. 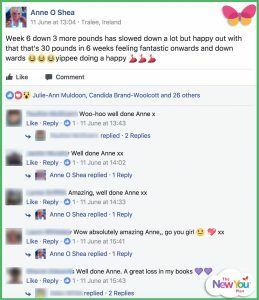 She said: “30 pounds in 6 weeks and feeling fantastic! Onwards and downwards! Yippee! Doing a happy dance.” Her joy and excitement at her loss is infectious! Well done to you both and to all of you for a great week of brilliant losses. Yum yum in my tum! 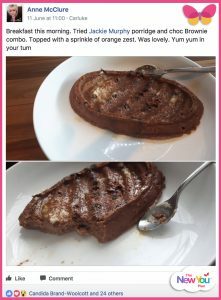 Did you see Anne McClure’s Choccy Porridge Breakfast with Orange Zest? Inspired by Jackie Murphy, this is becoming a firm favourite within Secret Slimmers. Keep the ideas coming in guys!! That’s all folks! Keep fighting! There will always be haters, there will always be doubters, there will always be non-believers and then there will be you proving them wrong! Have an awesome 100% week.